Foreword | Mount Toba influenced our cultural evolution. It may have been awhile since you read Why Men Made God. Review the Foreword. Image from "Earthquake Swarms are Shaking Yellowstone's Supervolcano. Here's What it Means", by Elaina Zachos. National Geographic. February 22, 2018. 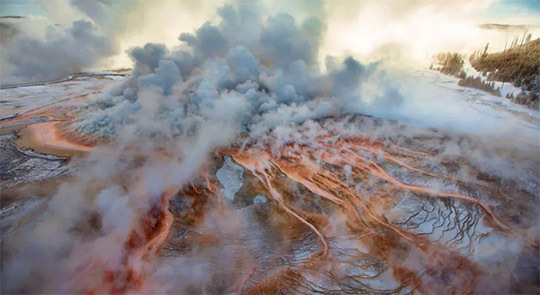 Beneath Yellowstone Park sits a cauldera, a vast cauldron of bubbling magma. For the past two million years, this supervolcano has erupted roughly every 600,000 years. The last major eruption was 640,000 years ago. Recent earthquake swarms and the increasing size of the magma chamber are providing disturbing warning signals. The question is not if there will be another eruption, but when. The volcanic ash and droplets of sulfuric acid and water will produce dense cloud cover that will obscure the sun and increase the reflection of solar radiation, thus triggering a volcanic winter. Millions will die and the blanket of ash will make most of North American uninhabitable. How do we know this? It has happened before. How will the ash cloud affect satellite reception? Wi-fi? GPS navigation? Food production? Water quality? Without skilled workers to maintain them, what will happen to nuclear reactors? Where will the pockets of human survivors be located? It is almost beyond imagining. Toba: The Toba Super-eruption. The Toba super-volcano has erupted explosively a number of times over the past 1.2 million years. By far the largest and most destructive of these occurred around 74,000 years ago. At least 2800 cubic kilometres of volcanic material was ejected during this super-eruption, dwarfing historical eruptions such as Krakatoa and Pinatubo. The Mount Toba caldera is now a lake, 100 km. long and 30 km. wide. The image below shows how the caldera lake might have formed. 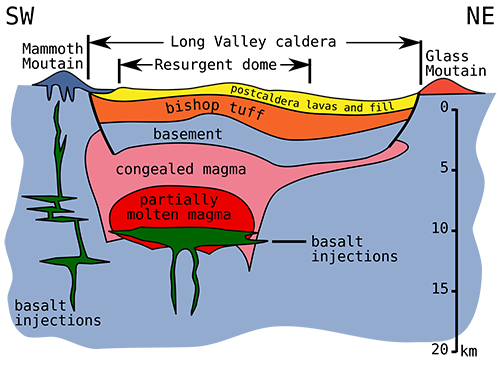 Learn more from the Wikepedia article: Supervolcanos.